For early career researchers, a fellowship can be a valuable foot in the door, exposing them to the opportunity to gain experience in areas of science and technology of national importance. At Oak Ridge National Laboratory, fellows are expected to contribute to the research efforts of the Laboratory, assimilate knowledge about the most recent developments in university science and engineering departments, represent ORNL in the scientific community, and work to advance the missions and goals of Oak Ridge National Laboratory and the Department of Energy. The Neutron Sciences Directorate’s two most recent distinguished fellows are living up to these expectations by making major contributions to their respective fields. The prisoners he watches are not those confined behind metals bars—they’re hydrogen atoms trapped in the molecular clusters that have fascinated him since his days as a graduate student at Lehigh University. 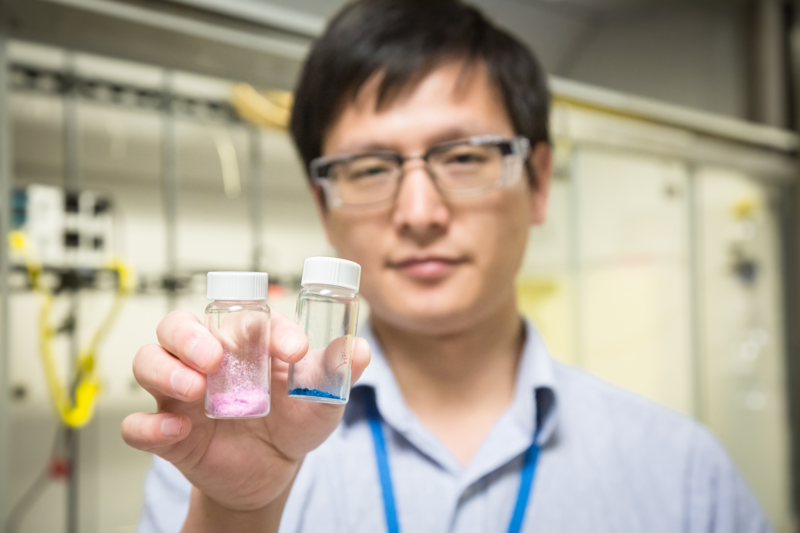 Yin’s research focuses on understanding a molecular cluster’s properties, mapping their various movements and transferring those properties into effective chemical catalysts and novel materials. The scope of his research allows him to split work between three Spallation Neutron Source instruments (SNS) VISION, BASIS, EQSANS and GP-SANS at the High Flux Isotope Reactor where he can use neutrons to study these molecular clusters more closely. Yin said his work as an independent researcher led him to extend his study beyond the clusters’ “solution behavior,” igniting a new mission by constructing self-assembling clusters and studying how the hydrogen atoms behave while confined in their cells. Because neutron scattering is sensitive to hydrogen atoms, Yin required the use of technology at SNS and HFIR, both DOE Office of Science User Facilities, to move his project forward. He noted EQSANS and GPSANS are ideal tools to measure the distribution and location of the imprisoned hydrogen-enriched molecules while VISION and BASIS are vital in understanding the dynamics of encapsulated molecules. “With neutron scattering, it gives me more information about the solution state of molecular clusters, and we can try to learn more details about the solvent composition around the clusters and study the dynamics inside the clusters,” Yin said. “This can never be done by using X-ray scattering or light scattering,” or other methods used by scientists to study material composition. Yin’s experiments with a variety of molecular clusters have allowed him to discover unexpected behavior by using carboxylic acids inside the molecular clusters. “Traditionally, phase transitions cannot be observed far below the melting point for these molecules,” Yin said. “But these carboxylic acids, they experience a phase transition according to our temperature-dependent dynamic study. These hydrogen-enriched atoms trapped in molecular clusters, according to Yin, may also mimic cell components in the human body, creating new opportunities for scientists to examine how pathogens and viruses change their biological properties since these molecules share similar internal structures. “We don’t know were this will lead us, but it’s a good start,” he said. Though Yin initially applied to ORNL as a post-doc, one of the selection committee members encouraged him to apply for the Shull scholarship after reviewing a resume and research proposal advanced enough for a research position. Since its inception in 2006, nine early career scientists have been selected for the Clifford G. Shull Scholarship program to join the Neutron Sciences Directorate at SNS and HFIR, extending the lab’s presence into the international scientific community. The academic honor was named after Shull, who, alongside Ernest Wollan, successfully used ORNL’s graphite reactor to establish neutron diffraction as a quantitative research tool. In 1994, Shull shared (with Bertram Brockhouse) the Nobel Prize in Physics for the development of neutron scattering techniques used today by researchers like Yin. The polymer scientist attributes his decision to pursue a career in science to his father, who taught chemistry to Yin and his brother in high school. Coupled with Chinese education’s emphasis on fundamental knowledge in his undergraduate years, he said a steady exposure to laboratory work also strengthened his development as an independent researcher. Bianca Haberl, one of ORNL’s Weinberg Fellows, also understands this work ethic as she determines the effects of high pressure on various forms of silicon using two SNS instruments. The Alvin M. Weinberg Fellowship honors Enrico Fermi Award-winner and former ORNL Director Alvin Weinberg. The fellowship is awarded to early career scientists and engineers who have exhibited strong leadership early in their careers, and who have an interest in energy and energy-related science and technology challenges. A member of ORNL’s Chemical & Engineering Materials Division, Haberl’s research at SNS is split between SNAP and NOMAD, targeted to discover new ways to compress and transform standard silicon into new materials with improved electronic and photovoltaic properties for cheaper commercial use. The ubiquitous quantities of silicon, the major component found in sand, make this research appealing and multi-faceted for the researcher who plans to apply high pressure to the silicon between two flat diamond faces—“squeezing” it in a so-called diamond anvil-cell. To combat this limitation, Haberl also focuses her research on indentation methods with small diamond tips, called “poking.” This method of transformation allows new silicon structures to have an increased surface area on a standard industrial wafer and thus much wider potential applications. Haberl said the behavior of these amorphous, or unstructured forms of silicon is the root of her fascination with the study of silicon. Haberl’s interest in studying such phase changes via pressure originated during her graduate study in Australia. During a nine month internship in Australia, Haberl, a native of Germany, said her first encounter with researchers introduced her to indentation experiments later fueling her return to pursue research for a masters and PhD. Haberl later returned to the Australian National University and her supervisors for continued study in the high-pressure indentation research for two advanced degrees. Upon completing her dissertation, she stayed as a post-doc while learning diamond anvil cell techniques—a well-known aspect of high-pressure research that Australian colleagues had not yet explored. For Haberl, a question still lingered from previous indentation studies: How does the hydrogen behave during each phase transformation? This question would lead her to pursue neutron scattering offered by ORNL’s SNS instruments as a Weinberg Fellow since it could not be explored by any other technique. Like Yin, Haberl credits her pursuit of problem-solving science to her Australian supervisors and instructors, Jodie Bradby and Jim Williams, not only as academic colleagues, but as catalysts for her independent exploration. Though her job doesn’t match the Indiana Jones glamour she imagined as child, Haberl maintains that her time in Australia, where she “scientifically grew up,” nourished her growth as a researcher. “I wanted to explore something,” she said. “That sort of morphed into physics because there is so much you need to learn before the exploring stage.